Although leadership has similar processes among the companies, there may be some minor changes according the leader type. The leadership process is practiced by each type of the leaders and composed of three phases. · Second Phase: Supporting the members of the team in order to make them to show their personal capabilities. · Third Phase: After combining the vision, mission, strategy and the capabilities of the members together, a decision is made and the action is performed by the help of the members. The graphical analysis of these different leadership types are depicted in the below graph for a better understanding. 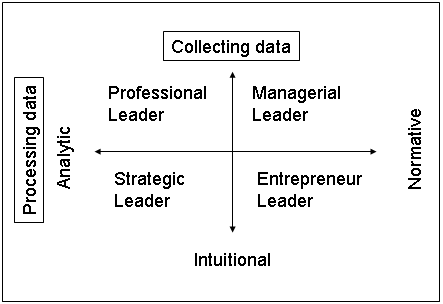 As seen in the above figure, professional and strategic leader is the analytic leader types whereas; the others are supposed to be normative. On the other hand, entrepreneur and strategic leader types are more perceptional to the outside environment and the changes happening in the whole world. When we want to give example to these leader types, a small business’s boss (with the previously mentioned leadership criteria) can be defined as an entrepreneur leader where the famous CEO of Chrysler, Lee Iacocca, can be a good example for a professional leader. Besides these, the best leader type is mainly depends on the culture of the company. The value system of the company selects the best leader for the organization and the leader shapes this culture into the right way. The culture of the companies may differ from each other regarding the sector or the country in which they are operating in. due to this the leader types of these different companies will be different also. Mustafa Özel, Stratejik Yönetim ve Liderlik, First Ed., İstanbul: İz, 1995, p. 47-48. Lee Iacocca, Iacocca an Autobiography, First Ed, USA: Bantam, 1984, p.141. Louis E.Boone, David L.Kurtz, Contemporary Business, Eight Ed., USA: Dryden, 1996, p. 211.